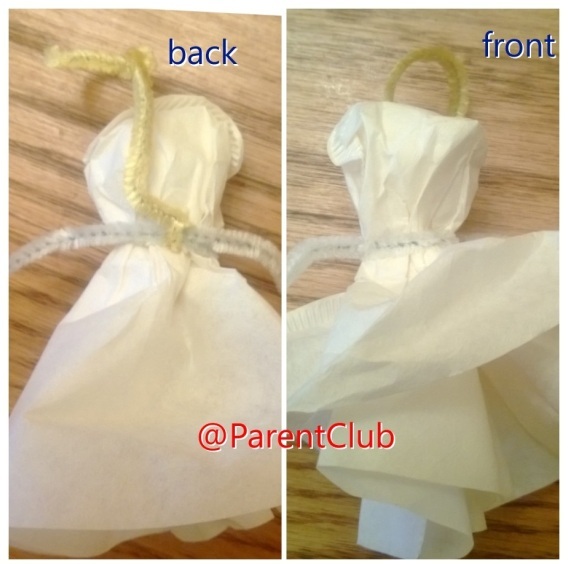 From the Parent Club archives but still a great activity for kids. 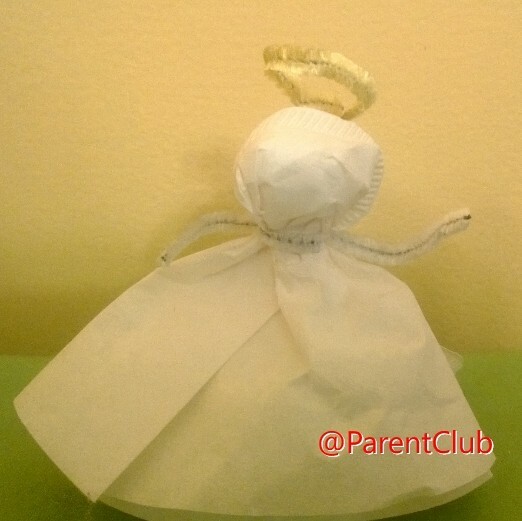 This is my easy “how to make a coffee filter angel craft” for kids of all ages. I made these in minutes with the kids using art supplies we already had in the house. Simple, creative and hands-on fun for kids. This continues the Parent Club series Gifts Kids Can Make. *You can use any sort of coffee filter. 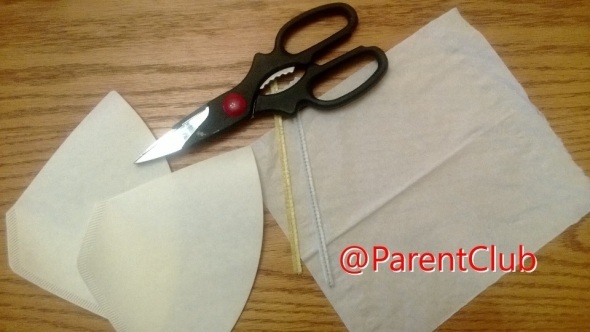 Crumple the tissue into a ball and place it inside one of the coffee filters. Layer the 2nd coffee filter over the first holding the tissue ball in place (it’s the angel’s head!). Wrap a pipe cleaner around just under the tissue ball securing it in place. Extend the ends of the pipe cleaner (making them the arms of the angel). Make a halo on one end of the 2nd pipe cleaner and use the other end to loop it through the 1st pipe cleaner. 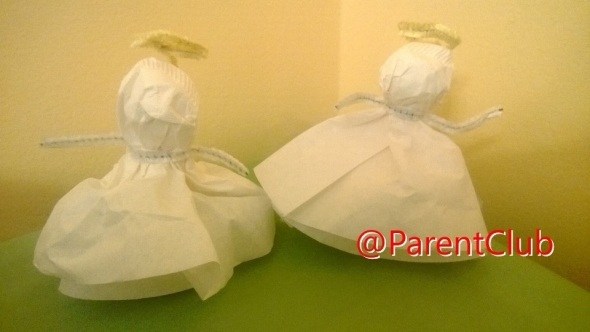 Use your hands to fluff the open ends of the coffee filter (fluffing up the angel’s robes). Voila! In minutes your can make multitudes of divine ornaments. You and your kids might also like to try DIY Recycle Greeting Cards Into Bookmarks and How To Make Salt Dough over the holidays. They make great Boredom Busters. Cute! You always have such great (and easy!) ideas! Thank you! What a sweet little craft! My son would love this. So creative! Thanks for the great idea! That is super cute. I bet my boys would love to make these! Thanks…and now I have a hankering for coffee…. That is cute and would be easy for littles to do as well. That’s cute! My girls would love to do this! Great idea! I love angel decorations. Thanks for hosting. Cute. The last time I taught kids a craft, I thought it was very stressful. LOL. Neat idea! This can make a great ornament as well! children will love making these, so simple but impressive. So cute and so fun for my little guys! This is such a cute and easy craft for the little ones to do, I am sure they will have great fun! My child has special needs & it’s hard to find really simple craft ideas which don’t require a lot of fine motor planning. This one is easy & is something he’d be able to do with minimal help. Thanks! Super cute! Thanks for this tutorial!